The Servette™ is a DCC compatible accessory decoder capable of driving a servo motor. A servo is ideal for animation such as turnouts (switches), semaphores and crossing gates. The small size and simplicity of installation make a servo especially suited for tight places and double deck type layouts. Even though they are small in size they are very durable and robust. Typically they have plenty of power for animation tasks. 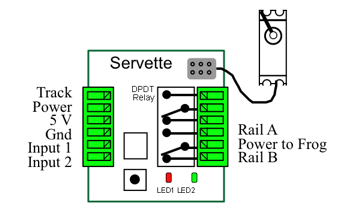 The Servette™ includes a DPDT relay. The relay can be set to follow the servo turnout position for routing frog power and reverse loop power or set with it's own address to be independent of the servo for control of other devices like a Tortoise™. Board size: 2.0" X 2.0"
Servos can easily draw 2 or 3 times the current of a Tortoise™. "Power Save" is a default option that essentially allows the Servette™ to remove operating power from the servo when it is not moving. Since turnouts are not operated continually this can 'save' a lot of power. Simulation of frog power routing. Application showing how to drive a servo and a Tortoise™.